content:"apikey" AND content:"Transfer-Encoding: binary" AND content:"%015d--"
type:apk behavior:http behavior:"Sign in to your account"
This said, the most attractive new feature of VT Hunting is the fact that you no longer have to wait for the next "train departure" when enqueuing a retrohunt, your jobs are kicked off immediately and results start to come in without delay. This also means that you can launch several retrohunt jobs without waiting for previous tasks to conclude. Code signing is the method of using a certificate-based digital signature to sign executables and scripts in order to verify the author's identity and ensure that the code has not been changed or corrupted since it was signed by the author. This way, for example, if you modify the content or append any data to a signed Windows PE (.EXE) file the signature of the resulting file will not be valid for Microsoft Windows, as expected. This behaviour changes when you append any data to the end of a signed Windows Installer (.MSI), the resulting file will pass the verification process of Microsoft Windows and will show just the original signature as valid without any other warning. A JAR file allows Java runtimes to efficiently deploy an entire application, including its classes and their associated resources, in a single request. The interesting part for exploiting the commented scenario is the JAR file format is based on ZIP to store the different components and resources, and this kind of ZIP is correctly identified by the presence of an end of central directory record which is located at the end of the archive to allow the easy appending of new files. When Java opens a JAR file it looks at the end instead of the beginning of the file, so a JAR file is executed independently of the data at the beginning of the file. In addition, on Microsoft Windows systems, the Java Runtime Environment's installation program will register a default association for JAR files so that double-clicking a JAR file on the desktop will automatically run it with "javaw -jar". Dependent extensions bundled with the application will also be loaded automatically. This feature makes the end-user runtime environment easier to use on Microsoft Windows systems. In short, an attacker can append a malicious JAR to a MSI file signed by a trusted software developer (like Microsoft Corporation, Google Inc. or any other well-known developer), and the resulting file can be renamed with the .jar extension and will have a valid signature according Microsoft Windows. For example, via the command "copy /b signed.msi + malicious.jar signed_malicious.jar". The victim can be infected with just a double-click in such a file. We would like to thank Mark Russinovich and Mark Cook from Microsoft for working with us in the study of the issue and their quick response with a Sysinternal's Sigcheck update to detect this kind of malformed files. VirusTotal also detects this attack vector via the updated version of Sigcheck with the warning "Signed but the filesize is invalid (the file is too large)" in the Signature info section. 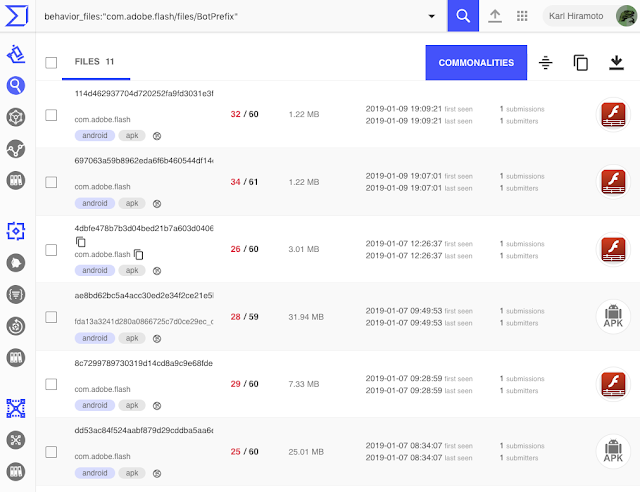 We are pleased to announce the addition of ReaQta-Hive to the multisandbox project, after the integrations of Tencent Habo, VirusTotal Droidy, Cyber adAPT ApkRecon, and Dr. Web vxCube. The unique new feature that this integration brings is XSL documents in addition to PE files, PDF, MS Office documents and scriptlets. 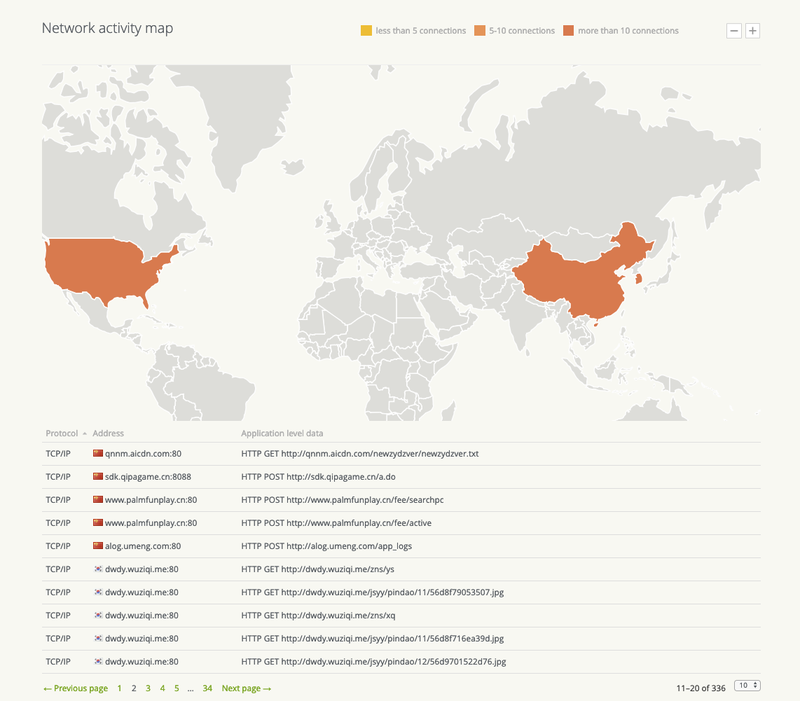 ReaQta-Hive is an Endpoint Threat Response and Hunting platform that uses A.I. to detect new types of attacks. A live hypervisor, called the NanoOS, collects detailed security information at the lowest possible level of an endpoint, which Hive uses to perform dynamic behavioral analysis. This analysis is automatic and constructs a comprehensive storyline of an attack. 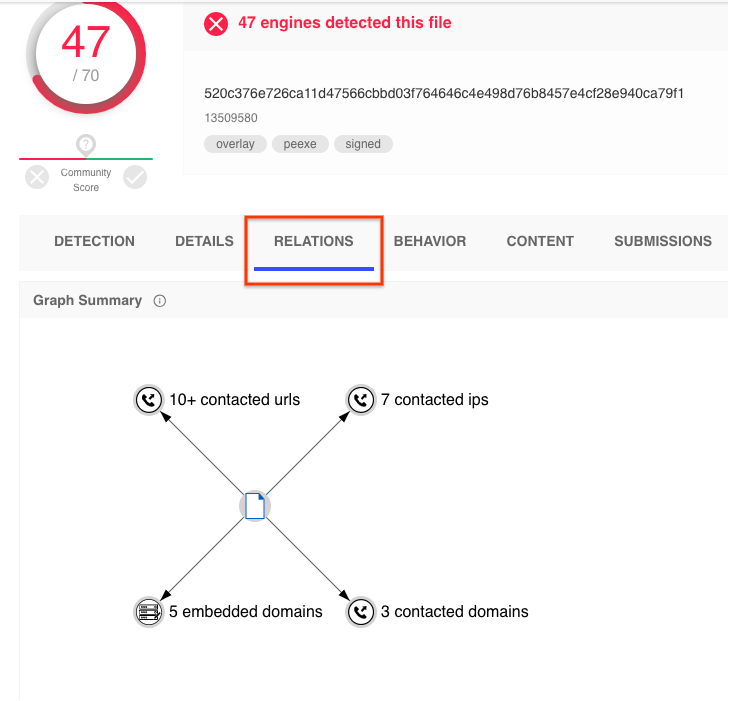 The end result is an intuitive report of all the actions carried out by an attacker, including a summary of the meta-behaviors that highlight key components of the attack. 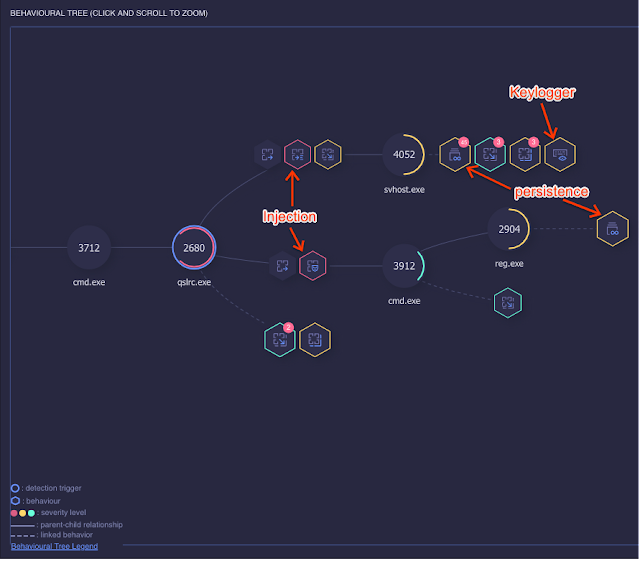 ReaQta-Hive is a vector-agnostic platform, so it can analyze the behavior of any type of attack, whether it is file-less, script-based, exploit driven, or a plain executable file. We are happy to use our software and expertise to contribute actively to the VirusTotal community, and to help analysts worldwide be more effective and efficient. To view the ReaQta report when viewing a file analysis, click on the Behaviour tab, select ReaQta-Hive, then the detailed report. Lets take a look at some example use cases where this data is interesting. 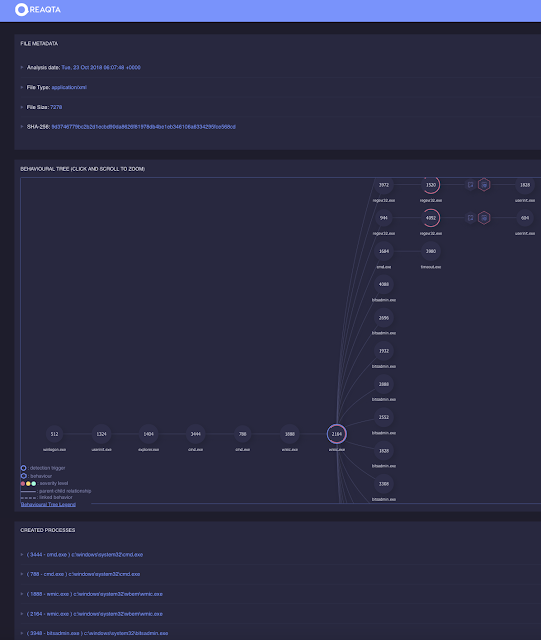 In the relationships tab you can see a link to VT Graph where you we can see some relationships to other domains and URLs VirusTotal has seen before.